Betting on TV, much like placing a bet on a sporting event, relies on the adrenaline of the live experience. Whether you are watching your favorite team, or your favorite show, live TV creates a massive sense of expectation and drama ripe for a gamble. As with sports gambling, the magic of TV betting resides in its unpredictability. A less known practice than its athletic equivalent, gambling on TV shows is increasingly represented in bookmakers' odd books. Whether you are looking to bet on your favorite TV program or seeking to diversify your gambling options, this article outlines where and how you may bet on TV. The world of betting on TV also includes an entirely different practice, that of picking odds and selecting your wager directly from your TV screen. A new generation of apps available on your television will allow you to bet on an event as you watch it: whether you are wagering on sports while you watch them or picking odds on TV shows through your TV screen. The functions available from such applications are also considered in the following article. Bets on TV cover a vast array of event types: from reality TV, to current TV series, and even including entertainement awards. However, whereas most bookmakers' websites offer a few standard options for TV betting covering hit reality TV programs, some offer a much wider selection of shows to bet on. Most bets opened by bookmakers on TV programs are “outright”, that is a bet directly on the final winner of the competition, with some occurences of bets on the gender of the winner. For certain award shows, bets may be open on certain categories of awards only, as in the Oscars for example which features larger categories such as “Best Picture” and omits other smaller ones such as “Best Costume Design”. Lastly, odds are defined on the same basis as sports events: bookmakers make statistical analyses of the odds of each proposed outcome. You may then select the bet and the associated odds that you prefer. Usefull tools to compare online offers such as oddschecker also offer their services for TV betting, you may find their page on the following link. In regard to these criteria, the offers from William Hill are unparralleled, be it in the diversity of bets and the thoroughness of the selection of events. In addition, members at William Hill are entitled to promotions and bonuses, the terms and conditions of which are outlined in the following article. If you wish to join and enjoy exclusive deals and benefits, click on our priority link. The following table summarizes the selection of TV programs to bet on from the main online bookmakers: William Hill, Bet 365, Ladbrokes, SkyBet, and PaddyPower. Please note : most TV bets offered from the following bookmakers will either appear in a dedicated “TV” section of the sportsbook or in the “specials” rubric. Increasingly, live betting from the comfort of your living room on the event you are watching is becoming a reality. A new generation of apps accessible from your TV allows you to access the full range of odds available at a bookmaker, place your bets, and move funds in or out of your user account through your remote control. Paving the way for new advances in the realm of TV gambling is Paddy Power's smart TV app and Sky Bet's accessibility from Sky TV. For example, while viewing a show like “American Idol” : users can log into their Paddy Power account, credit their player balance, choose how much to wager and bet on “American Idol” live, directly from their smart TV. 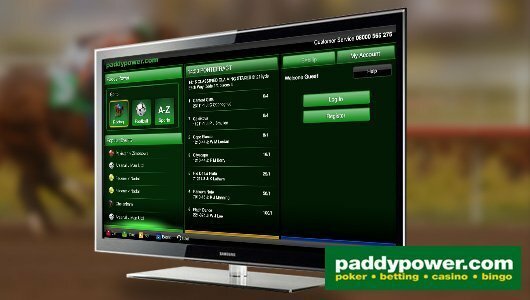 For more information on this functionality offered by Paddy Power, refer to the developper's overview of the application. These new applications allow you to Bet on events from your TV as you view them on your TV, therefore integrating your viewing experience and your wagering action to an unprecendent extent.